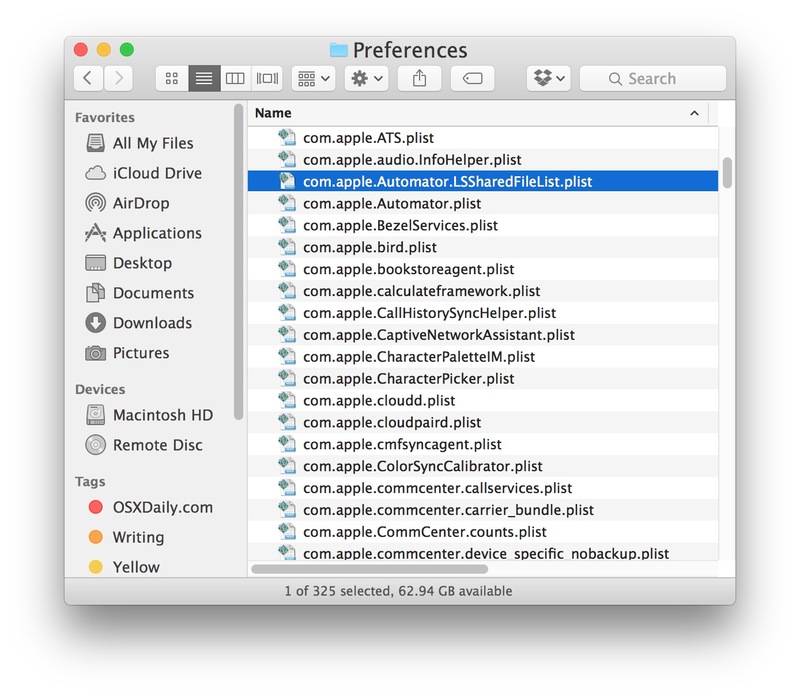 Many Mac users may like to adjust the font size of file names, folders, and other text found in the Finder of OS X. This is particularly helpful if you find the default text size of Finder fonts to be small and challenging to read when navigating in the Mac file system, where increasing the font size makes a notable difference in legibility, but it can also be used the other direction to decrease the text size of Finder items as well, thereby fitting more items on screen in list view. Whether you want to change the text to a larger size or smaller size is up to you. For reference, the default text size for Finder items is size 12, and user options to change Finder text size range from size 10, 11, 12, 13, 14, 15, or font size 16 as the largest. Changing the text size alone will have no impact on icon size, which can be changed separately. In the example shown here we are changing the font size of Finder items shown in List view, but it works the same in Icon view, List view, Column view, and Cover Flow. Assuming you chose “Use as Default”, any new Finder window opened within the file system in that particular view mode (list, icon, column) will now always appear with that font size. If you did not choose “Use as Default”, only this specific folder within Finder will show the new font size change. Going further, you can also increase the size of Mac icons on the desktop and in Finder windows, as well as change the Finder sidebar text size in Mac OS X to better suit your preferences as well. There is no Set as Default option. In 10.11.3 El Capitan below Text Size there are 3 check boxes then its blank grey area. When you change the text size its a universal change throughout Finder. Tom, this setting is for Mac. 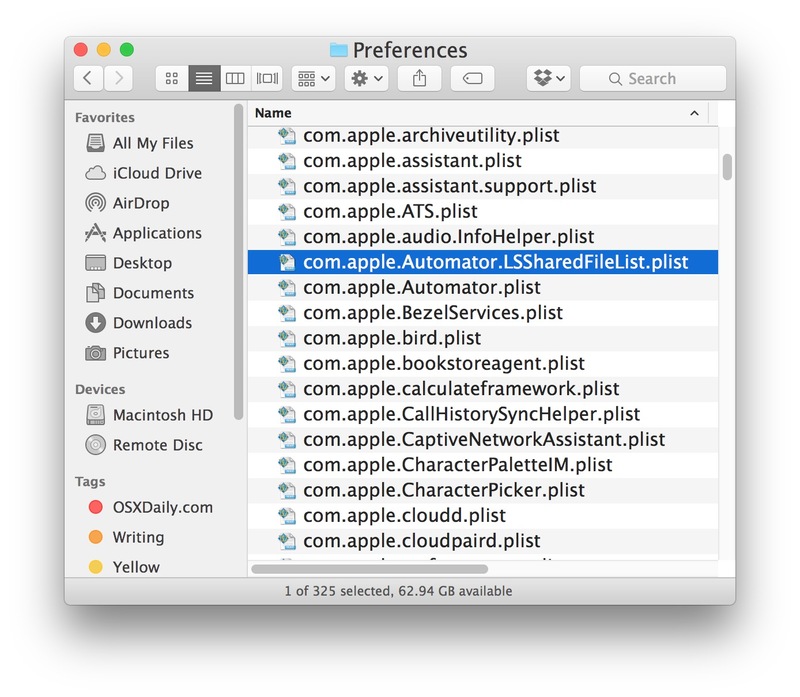 It is labeled as “Use as Defaults”, it is a button in View Options for Finder windows. This is version agnostic. For example, I am in OS X El Capitan 10.11.3 and another Mac next door has OS X 10.11.4, the Use As Defaults option is there exactly like shown in the screenshot. In fact, every version of OS X ever made, since OS X 10.1, has had this option. I have been using the platform since OS X 10.1 and I always make this change because Apple is bent on making the font size as small as possible. If you don’t see the option, you either have it off screen from a small resolution, the window is off screen,, or you are not following the instructions that are articulated in the tutorial above. This option is not on an iPad or iPhone, it is on a Mac only. It is version agnostic for Mac. I’m also at 10.11.3 and the Default option does not show up for the Columns option (it does for the other 3 options). 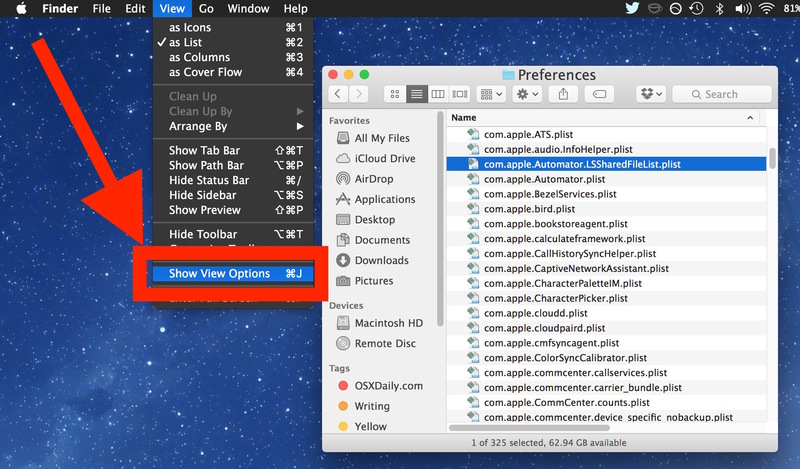 Open a folder or a volume, then Show View Options – you will see “Use as Default” button on the bottom. It will not show up if you are just on a Desktop. Thanks for the great tip, which helped me greatly. Do you know of any way in which to also change the font size in Finder’s Sidebar? Thanks again :-). That helped a little bit; though there is just a tiny difference in the sidebar between medium (my previous setting) & large folder font sizes. It’s too bad that they don’t allow us to just change the text size. The problem is that this does not affect windows opened using Open or Save. Those windows revert back to the system default font size. Yes I use size 14 on MacBook Pro retina I had to after Yosemite and El Capitan came out with the new hard to read fonts. Before in Mavericks I kept at size 12. The new fonts are tough unless they’re bigger. Apple should give a bold and dark option too. The only working way to change the size of the font in the finder windows is to reset it. All that you have previously changed will not be changed with the directions above (I think, but I am not sure because I did not try). I reiterate. It does NOT work in Column view. It says pretty clearly that it works in List View, Icon View, and I just tried it in Column view and it works fine to increase the finder text size of all items in Column View too. So if I can change my font size in column view, why can’t you? Probably not following instructions. Would like to change colour of type on desktop icons to suit desktop image. White type is of no use on my preferred light background. Can this be done? 1) I have to go down the side bar and change the fonts for each directory. How stupid is that? 2) If I use finder for another computer on the network, I have to change all the fonts there as well. How can I set the finder to also use the font I want? Is there a way to make the grayed file names, when saving a file to Finder, a bit darker so that I can read them? Good info—but this changes all fonts/folders—it does not allow for one, say, important folder’s name to be changed to Green with a larger font to stand out amongst other unchanged ones. This is a great point, thanks Jeff. 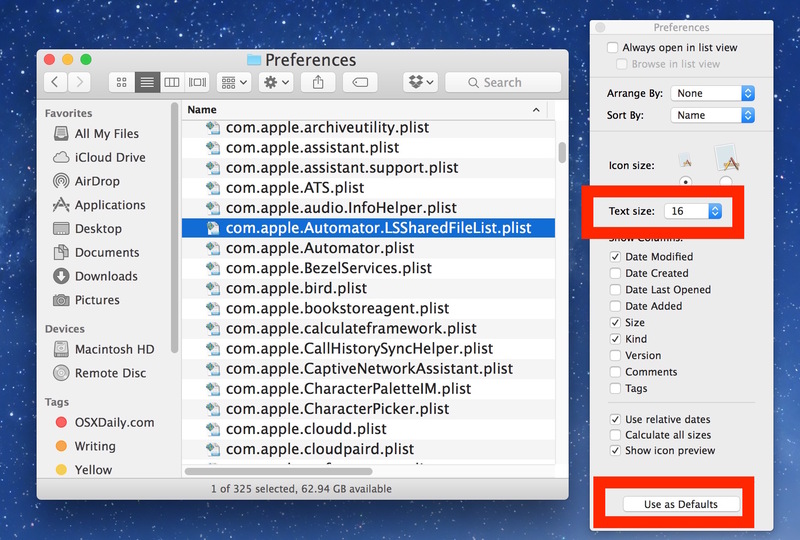 It won’t change the text size of a Finder item but if you want a folder name to stand out the best way to do that is with the “Tags” feature in Mac OS. This places an emphasizing color behind the file or folder name. Tagging makes a folder or file stand out with a color accent behind the name, it’s helpful for what you describe.